Practically everyone out there (well, parents at least) have heard of the classic kids book Goodnight Moon. Honestly, the book isn't that interesting. Definitely not one of my favorite books of my kids. But Connor seems to really be into it. Or maybe its just how wonderfully I read it. I digress. Anyway, the first parody of it I saw was Goodnight California. I thought it was cute. Cute enough to buy for someone as a present (not one of my kids though...I am super cheap and alway get their books at thrift stores). While we were in Portland, we visited Powell's, the largest independent book store in the world. If you are ever in Portland, I highly recommend it. It was like being in a library. So amazing. But, to get to my point. I ran across a book that is totally up Connor's alley - Goodnight iPad. Crazy, right? But so stinking funny. And given that Connor is obsessed with iPads (sad, right?) I thought it was funny. He wasn't as obsessed with the book and instead ended up taking home a Maisy book, but still. I am thinking these books are mostly written for the parents...to entertain us on those nights when we have to read the same book over and over and over again. P.S. I almost peed myself while looking up these books on amazon and seeing them offer kindle edition of board books...does that mean the baby can safely gnaw on the kindle when the book is open?! 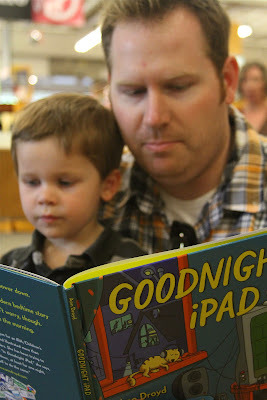 I've read Goodnight Ipad. It's silly, but not as good as the classic. Have you ever read "Go the F*ck to Sleep"? If swearing doesn't bother you, I think you'd find it hilarious.